There's a real opportunity for SaaS businesses to create engaging and entertaining promo video content. All the top SaaS brands have used this strategy to connect and excite new audiences with this technique. 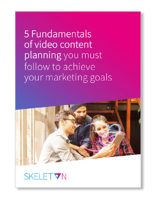 Skeleton have written this article and content planning download to help inspire you to start creating your own effective SaaS promotional videos. All SaaS companies start off small fish in a big pond. But little fishes can go far. Just look at Salesforce, HubSpot and Slack. We all want to turn into whale sharks like them. And as it turns out, they all used promotional videos to help them. That's because in our modern world video content is a hugely effective way of getting attention, explaining your value, and even convincing potential customers to take the action you want. I'm going to show you real examples of the videos SaaS companies use to become whale sharks... and exactly why they work. Keep scrolling for 7 of the best SaaS promo videos ever. What Makes a Great SaaS Promo Video? Before we run through them, let's review how I actually chose these 7 videos. 1. It turns a complex idea into something simple. I bet your SaaS offering is pretty complicated. But any good SaaS video should trade confusing complexity for pleasing simplicity that leads to greater audience understanding. 2. It stands out from the crowd & communicates uniqueness. There are a lot of SaaS brands out there, and competition is fierce. Your video needs to get across your USP and make you seem different from the alternatives. 3. It makes the audience really feel their pain point. To gain new customers, you must show how they're are worse off without your service. The best SaaS videos have a strong pain point that hits their audience where it hurts. 4. It encourages viewers to take action. What's the point of a video that doesn't cause a change in its audience? None. So make sure yours encourages potential customers to start a free trial, get in touch, or just find out more. 5. It helps build a solid and consistent brand. Every SaaS company that's found serious success has done so with a strong brand. To quickly earn a place in customers' minds, your video content needs to support and reinforce your brand. What makes it stand out: A creative idea. A funny script. High production values are just the icing on top. This is a genuinely unique ad that you'll remember for a long time to come. Why it works: The crux of this video is a real pain point taken to the extreme. Adobe's target audience are marking managers worried about what their efforts are achieving. For this promo video, they took that legitimate concern and dialed it up to 11: what would happen if an ineffective & confused marketing department had control over a space launch? The result is a ridiculous but funny situation that makes potential customers think about how their own marketing is performing. And shames them into doing something about it. How to do it yourself: At the top of funnel you can advertise your SaaS solution without even directly mentioning it. Instead, gain broad awareness and engagement at an early stage in your customers' buying journey by getting your name out there in an exciting & memorable way. What makes it stand out: This is a clean, friendly animation that wastes no time drilling right into the root of the problem (website visitors that don't convert) and how Crazy Egg can solve it. It's also got little touches of humour, like the mustache pull at 0:37, that keep viewers engaged. Why it works: Crazy Egg solves quite a complicated issue, and the features it offers are equally complex. But this video doesn't get bogged down in the hard stuff. Instead, it boils a lot of information down into a simple message: Crazy Egg will help you convert people better. Plus, it makes its audience an offer they can't refuse (but not like The Godfather). A free 30-day trial teased at the end of the animation acts as a strong Call-to-Action. This video actually helped the SaaS brand increase their homepage conversions by 64%! How to do it yourself: A good explainer video can be a massively useful promotional tool for years to come. Invest in a good script that explains clearly what you offer and a style of animation that matches your brand — you'll be on to a winner. What makes it stand out: This success story isn't like other success stories. It takes the time to really delve into what the customer does and cares about. In fact, the focus is entirely on them, rather than Salesforce itself (it's the hallmark of any great case study). Why it works: Because it's a client talking about how the SaaS service helped them, success stories like this are very effective mid-funnel promotional pieces. They're authentic and can communicate the features and benefits of your service in a non-forced way. Plus, this case study follows a tried and tested story template to explain the issue their client was facing and how they helped to solve it. A classic structure like this gives your success story direction and allows you to convince leads to become buying customers. How to do it yourself: Your clients are your biggest advocates. Find a customer you've helped to achieve something awesome, and tell their story. You'll show what your SaaS service does and the problems it solves, all while staying humble. What makes it stand out: It's short, snappy and stylish. It's also clear that we're watching an actress deliver lines, which adds some extra flair missing from some of the other examples — but the video is no less convincing for that. Why it works: This is a clever one. It portrays the users of TripCase as the type of person their target audience wants to be: smart and crafty travellers. The implicit suggestion is that they should use the app to embrace the life they want. There's no stronger desire than the desire to be somebody else. In this example, the SaaS brand uses that desire to make viewers feel the pain of who they could be compared to who they are now. And encourage them to take action towards that goal. How to do it yourself: A little bit of psychology can go a long way. To create any great video you need to understand the ins and outs of your target audience, how they think, and what they really want. Reflect that back at them and show how your service can help them get it. What makes it stand out: This video is as clean and fresh as... well... mint. It's professional and uses graphics of the software in action with specific examples to show how it works. Why it works: Before making any decision we consider a lot of information. The best SaaS promotional videos help viewers to run through all these details quickly, allaying their fears and freeing them up to say yes. Mint's explainer animation provides all the information potential customers might need to know before signing up, in just 90 seconds. After watching, and thanks to a strong Call-to-Action, their audience should be ready to try out their service immediately. How to do it yourself: Consider all the potential questions and concerns your ideal customer might have before signing up to your SaaS offering. Answer them all with your video, and then give them a Call-to-Action they can't turn down. What makes it stand out: When you're competing for attention against all the other things your audience could be watching, you need to grab that attention quickly and hold on tight. This video is funny, different, and it had me hooked from the first line. Why it works: The brand presence in this promo video is strong and oh-so punchy. Notarize don't take themselves too seriously (which is an attitude many SaaS companies can embrace, unlike more established and traditional brands). It really pays off. Viewers get to learn about the service while also being entertained. It's a win-win for both sides, because Notarize also get draw in interested leads while growing their brand awareness. How to do it yourself: Be creative with your video content. Don't be afraid to incorporate humour, storytelling, or something a bit different. You'll stand out from the competition and build a name for yourself. What makes it stand out: This video is simple and utterly grabbing. While it might only be 30 seconds long, in that time it manages to give one very convincing reason why Square is better than the alternative. It's a great example of why simpler can often be better. Why it works: Square don't try to overexert themselves by communicating too much in just one video. Sometimes that can work, as in the explainer examples above. But the further up the funnel you go, the less your audience can be expected to take in. So for this quick-fire testimonial that's actually used as an advert, Square decided rightly to keep it simple. Their message is strong and unmissable. The client is honest and authentic. In this video they do one thing really well, and that's why it works. How to do it yourself: Find a customer that is comfortable in front of a camera and ask them for a testimonial. You might record a lot of raw film, but you could get something golden — and this kind of footage is always useful and reusable further down the line. So there you have it. Those were 7 of the best SaaS promo videos ever. If you want to become a successful SaaS shark like these brands, learn from how they've used video content to create a solid USP that stands them out from the competition and encourages potential customers to sign up. Explore how you can apply these lessons to your own business. Once you get these basics right, it's all about getting your name out there. And becoming the whale shark you know you should be.